Discussion in 'Z3 Roadster & Coupé' started by vintage42, Feb 8, 2014. New shocks have an offset spacer tube permanently inserted in their lower mount hole. The tube sticks out one side more than the other, so depending which way the tube is turned, the spacer can be put on the outboard or inboard side of the shock. In this video at 4:50, the spacer is shown placed inboard of the shock, between the shock and the bolt head. However, a photo in the Bentley Manual shows the spacer on the outboard side of the shock, between the shock and the trailing arm. But the photo is just to point out the bolt that must be removed. What is the correct orientation of this spacer tube on the mounting bolt? 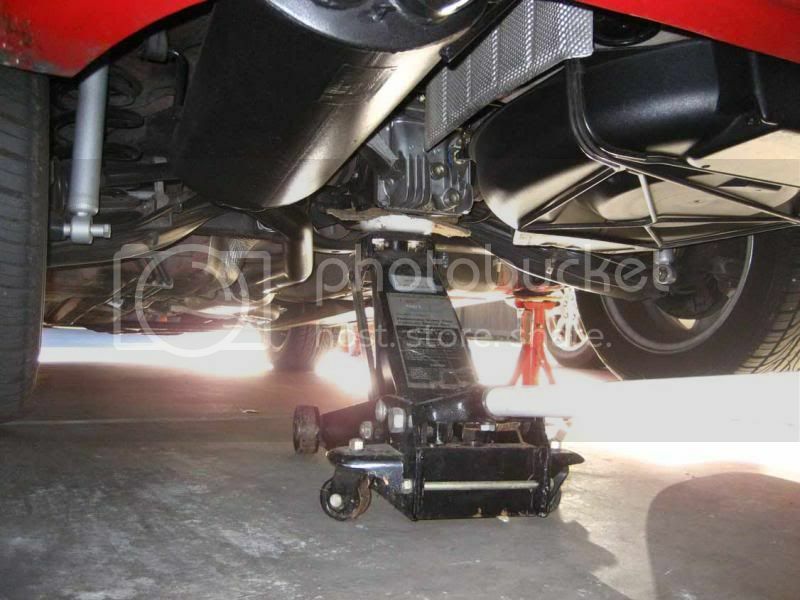 Is the shock mount supposed to be close to the trailing arm, or cantilevered out from the trailing arm by the spacer? Does the incorrect orientation, whichever that might be, cause a misalignment of the shock in the upper mount, or a bending force on the bolt in the lower mount? Is there a reason or reference for that? I think it's to keep the shock in a more upright position, well that's the only thing I can think of. I would assume also it is for alignment, the reference is contained within the BMW TIS, and also from actual fitting when i replaced my original parts to Bilsteins. It does not make sense to have it on the outside, as a spacer in this position serves no purpose. Can you post something of the TIS reference? That is what I would be looking for. On alignment, the verticality of the shock is not important, at many shocks are mounted at steep angles, on trucks and off-road vehicles for instance. It might be important for the shock to enter the upper mount perpendicularly, though that mount is rubber and it's hard to say where its "perpendicular" might be. What do you mean by the actual fitting of the Bilsteins? From my Z3 I have removed Sachs, and installed both Sensen and now KYB. I imagine the Bilstein shock mounts are the same, so we are seeing the same thing. So I am just looking for an actual reference on which end of the bolt sleeve goes against the trailing arm. I don't think it needs to be vertical just in line with the upper mounting point to reduce side loading stress on the upper mount and piston. My reference to the Bilsteins was that I fitted them in the same manner as to which the OEM ones were removed I.e. Bush to the trailing Arm, you also need to bear in mind this setup is borrowed from the E30, which will no doubt have different upper and rear mounting points to the Z3, hence why a spacer may be used to get alignment, in reality I don't know, but there is no purpose in fitting the bush on the outside. Hope it helps, if not just fit one inner and one outer and see what happens, you will only have to replace one shock then when it fails. Thanks for the TIS! It does not say which way the shock base should be oriented. 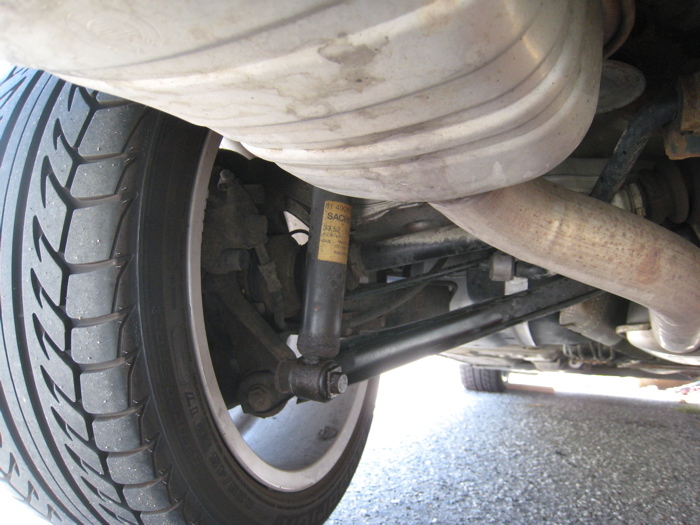 And the illustration in the TIS as well as the photos in the other links all appear to show the shock mounted tight against the trailing arm with no space between them. But I don't think the photos are Z3 BMWs, because the shocks don't appear to have bushings that stick out on both sides of their mounts. However, as I look at my "unspaced" shocks from the rear, I now see that they are not perfectly perpendicular to their bolts, but tilt slightly inward. That can't be good for the rubber around the bushing, or the bushing itself. To fix that, they need to be turned 180º to put the longer "spacer" side of the bushing between the shock and the trailing arm. So I will jack up the rear, undo the bolts, and turn the shocks so they are "spaced". The first three links are all Z3 and clearly show the bush in place? Maybe the pix of the Bilstein in the Bimmerfest link shows the bush spacing, but it's not very clear. I think the most convincing photo is the one in the Bentley Manual. 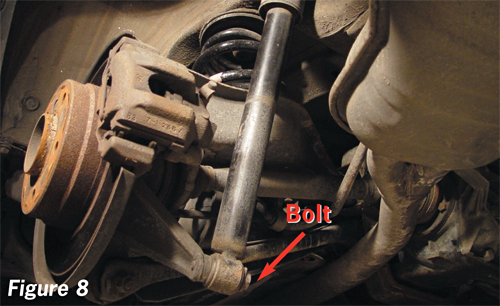 It is only for the purpose of showing the bolt to be removed, but does show the space between the shock and the trailing arm. "Spacer" is a word I made up to describe the bushing tube that goes through the lower eye of the shock, and protrudes out on both sides, but more on one side than the other. The longer protrusion could be used either to make a big space between the bolt head and the shock, or to make a big space between the shock and the trailing arm. The shorter protrusion makes a small space. I was curious whether the space between the shock and the trailing arm should be big or small. Now as for sitting in space, that's something else. It is neither a spacer per se, nor a BMW part. It is a lower shock mount bushing, which all brands of shocks have for all vehicles. It is an integral part of the shock that receives the mounting bolt and isolates it from the shock with rubber. For the BMW Z3, the bushing extends out more on one side that the other, evidently to align the shock perpendicular to the bolt. You mean it spaces out from the trailing arm? Yes, while on many cars the bushing is flush with the shock and creates no space between the arm, the bushing on a Z3 shock protrudes on both sides of the shock eye. One side protrudes 3/8" and the other 3/4". To align the shock exactly perpendicular to its bolt, the 3/4" side must be placed against the arm. Yes. Here'a a photo of my bushing, with the short 3/8" protruding end being used as the spacer instead of the correct 3/4" end.